If you happen to be traveling the back roads of Alabama the last week in August you’ll certainly want to make a stop at the Okra Festival held every year in Burkville. Neighbors will taste one another’s fried okra and rich gumbo, and you can buy loads of it cheap as chips right off the farm. There’ll be blues singers and okra inspired arts and crafts for sale, too. Barbara Evans, festival coordinator writes, “Okra is the people's vegetable…grown in places where there is still a sense of community. If it is hot enough to grow okra, you can't rush around at high speed. You've got to slow up and pick the okra!" Just up the road a bit from Burkville, and yet worlds away, lies another community with an affinity for okra. In the dwindling Sephardic community of my father’s birthplace, Montgomery, Alabama, the remaining Sephardim are tightly bound together in large part through the traditional dishes from our beloved Isle of Rhodes; dishes like “bamia,” a flavorful stew of okra, lemon, garlic and tomatoes. I grew up hearing my relatives share family news and recipes in fluent Ladino and chat over the meal in English with a southern drawl. So it is no surprise to sometimes find us enjoying our bamia with cornbread and fried chicken. Bamia made its way from its native Africa to Rhodes and throughout southern Europe and the Middle East by the 13th century. It was destined to become a staple in every country hot enough for it to thrive. Okra first arrived in the US in the 17th century through the African slave trade. 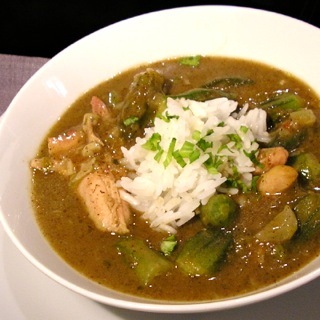 The native Indians of Louisiana discovered that adding okra to seafood and vegetable stews made them thick and hearty. It is just this thickening agent that gives okra such a misunderstood and maligned reputation. At first encounter one might shun the prickly pod for being gummy, slimy and mucilaginous, yet it is those very qualities that have made okra so important to southern and Sephardic cuisine for centuries. All too often we dismiss what we misunderstand and miss out on the perfect gifts Hashem is offering us. When properly prepared, okra’s texture is soft like eggplant, the flavor similar to asparagus and its tiny white seeds add a delightful appeal. It is also laden with too many health benefits to miss out on. University of Wisconsin nutritionist Sylvia W. Zook, Ph.D, rates okra’s high fiber content, similar to flax and psyllium, as having no equal among food fiber that feeds the good bacteria (probiotics) in the intestinal tract. Unlike high fiber grains which can irritate or injure the intestinal tract, okra's mucilage soothes. It also binds to excess cholesterol and toxins in bile acids and assures them an easy passage out of the body. In addition to fiber, okra touts an abundance of vitamins A, C, K, B6, thiamin, riboflavin, and folate. It’s a good source of calcium, magnesium, manganese, niacin, iron, phosphorus, zinc, copper and an impressive store of potassium. All this for only 25 calories and less than 6 carbs per serving. How’s that for a nutrient rich super food? If I haven’t inspired you to pack your bags and head down to Burkville for some okra art and nutritious country recipes, at least I hope you’ll give okra another look at home. I’ve included a Southern Chicken Gumbo with okra that we’ve been known to serve on Friday nights for a taste of down home Southern cookin.’ And try family-tried-and-true recipe for velvety Bamia; it’s a dose of soul food, Sephardic style. Find more articles like this in The Table of Contents for Cooking for The King.